aving performed the first run of dates for 2018's much-praised updated new set, Haçienda Classical with Manchester Camerata, the city’s experimental orchestra, is to bring its brand new soundtrack to Sefton Park, Liverpool on Sunday 22nd July. The LIMF appearance of Haçienda Classical will feature a third new set prepared by DJ's Graeme Parkand Mike Pickering alongside executive producer Peter Hook and musical director Tim Crooks. This version sees many new classic tracks added to the repertoire for the Haçienda Classical players and special guests. As the Haçienda's dance heritage has collided with the world of classical music, the concerts have been widely praised with great audience responses from the gigs and dates selling out in minutes. Now well into its third year, these inspirational nights have recreated the tunes that defined a generation at the original club, renewed afresh and rearranged with a classical orchestra. 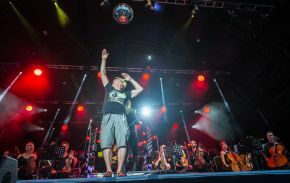 Haçienda Classical, which sees the club's original DJ partnership, Graeme Park and Mike Pickering reinterpret seminal dance classics with the orchestra and conductor Tim Crooks, has received rave reviews since its first Bridgewater Hall concerts a little over two years ago. It has since performed around 30 concerts playing to audiences totalling well over 200,000. The show has well outperformed any expectations and has seen an unrivalled atmosphere from the audiences attending the shows as well as from critics many of who have awarded the show five stars from the outset. Even at the very first Bridgewater Hall show, The Times gave it top marks declaring that "the atmosphere was incredible." Similar rave reviews followed from the first Royal Albert Hall visit as NMEcalled it "Probably the best rave since 1997" whilst Mixmag termed the event "a near two-hour blend of house music's greatest players with an audience dancing and singing from the off." LIMF is an inherently different music festival representing the next chapter of a global music city. Celebrating a decade of success since Liverpool being titled European Capital of Culture, LIMF shines a spotlight on the city's pioneering approach to its ever-evolving music culture with an unbeatable weekend programme that brings together music that celebrates the past, present and future, spanning eras and genres that co-exist through the connection of music. LIMF forms part of the Liverpool 2018 programme which is supported by the City Region Combined Authority with £5 million from the Single Investment Fund. Capital Liverpool is the official radio partner for LIMF. As proud supporters of the Liverpool International Music Festival, Aldi is giving festival goers the chance to enjoy a selection of its award-winning produce at its festival stall. The AMC Choir who perform at all the Haçienda Classical datessing with a style that fuses House and Gospel music perfectly.